Bing has started to introduce new ad extensions to their PPC advertising network, inline with competing directly against Google AdWords. A new ad extension that has been introduced has been the price extension. This is an extension that displays the prices of products or services, with a drop down arrow allowing the web user to view even more products/services and their associated prices. The price extension displays products or services with the prices of them respectively. The price extension is only available to adverts that get #1 spot on paid search. Bing states the extension will help to improve the click through rate of the advert and conversion rate on landing pages. An account, campaign, or ad group can have up to 20 price extensions. The extension is free to add to an advert. The price extension is not guaranteed to show for every search query. Cost per click on a price extension is the same as the title headline price. All price extensions are subject to a review from the Bing Ads team to make sure the price shown for the product or service correlates to what is presented on the landing page. There is a lot that Google AdWords offers for which Bing Ads does not, which is generally why AdWords is still the choice for pay per click advertising. It does not also help that Google have been doing PPC far longer than Bing/Microsoft too. 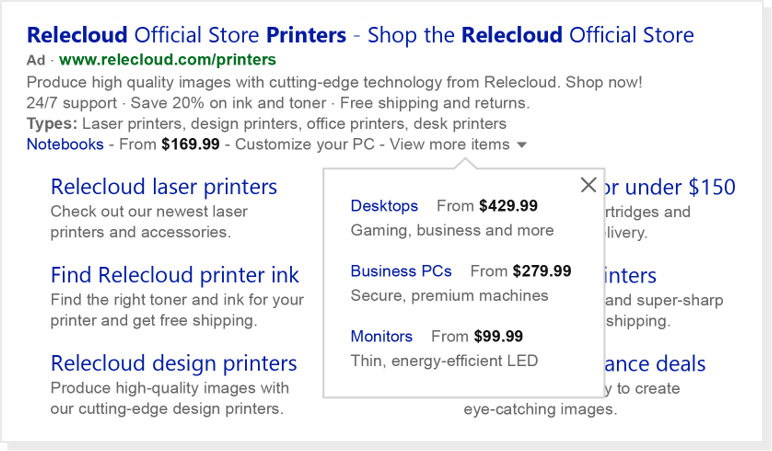 The introduction of the price extension pushes Bing Ads to closer heights to Google AdWords. There are a lot of campaigns that can benefit from showing the prices of products or services, such as smartphone contracts, electronics, gadgets, subscriptions and their variations etc. For this reason, although it seems like a small change, it can actually make a huge impact. Many of the biggest advertisers out there, with large budgets, will be running campaigns on both Google AdWords and Bing Ads. For this reason, the functionality increase to Bing Ads will further improve the performance of adverts, landing pages and campaigns, as a whole, for those using Bing Ads. There is still a long way to go for Bing Ads to be as good as AdWords. But, it is refreshing to see that they are pushing in the right direction.